They met the President of the United States even before the Olympics began. Before they set foot in Sarajevo, the 1984 Men’s Ice Hockey Team were treated to festive events and meals, honored in so many towns where they played exhibitions as if they had already won the gold medal. It’s hard for me to recall, but I suppose I and many other Americans had very high expectations for the 1984 squad. Our memories of the “Miracle on Ice”, proclaimed so emphatically by play-by-play announcer Al Michaels, were seared into our mind’s eyes. 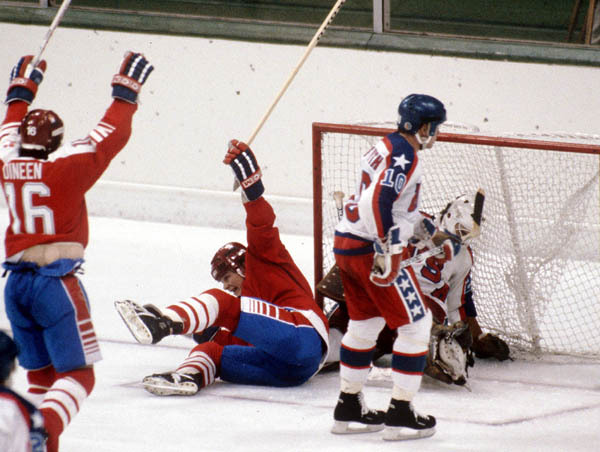 We can still today see the team throw their sticks and gear into the air, leaping into each other’s arms as the crowd (and an entire nation) exploded in unrestrained glee. The 1980 team crept slowly into our consciousness with an amazing buzzer-beating goal to tie Sweden in their first game in Lake Placid, an amazing upset of the Soviet Union in the semi-final match, culminating in yet another come-from-behind victory for gold against Finland. This team proved that David could slay Goliath, assuming David was American. So, of course the 1984 team was destined for greatness and glory. And the 1984 team sported a few great players, now Hall of Famers, like center Pat LaFontaine drafted by The New York Islanders, goalie Tom Barrasso drafted by the Buffalo Sabres, center Eddie Olczyk drafted by the Chicago Blackhawks, and defenseman Chris Chelios drafted by the Montreal Canadiens . They even had two players from the 1980 Miracle-on-Ice team, John Harrington and Phil Verchota. But the expectations were too great for the 1984 team. How could they possibly replicate the story of the 1980 team, their rise from nowhere to become a rallying cry for Americans, pained by the beatings they were getting internationally (hostage crisis in Iran) as well as domestically (an economic “malaise”). 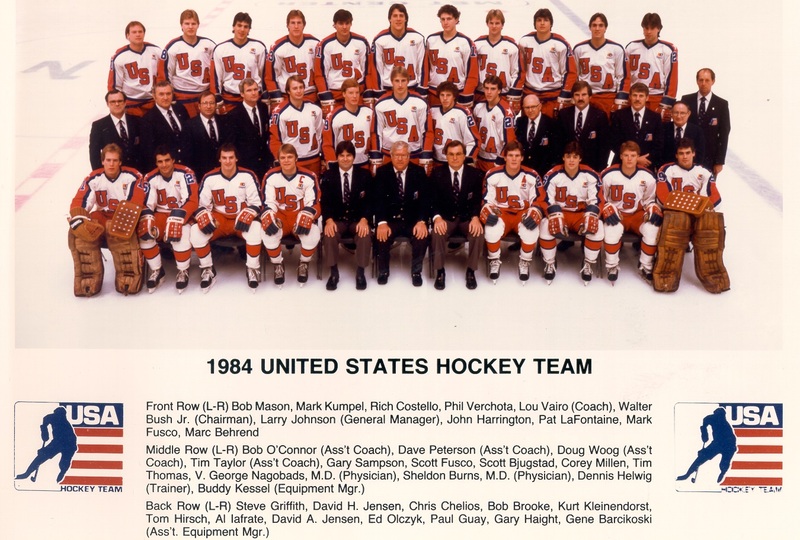 Even their coach, Lou Vairo, a virtual unknown who had more experience with roller hockey than ice hockey, thought that equaling the 1980 team’s success would be an even bigger miracle, according to this great article by Jeff Pearlman, called “A Miracle Put on Ice“. Those are not words Herb Brooks, head coach of the 1980 team, would ever have slipped from his lips. And yet, Brooks was not there to exhort the 1984 team to greatness. While it’s true the American team was routing the opposition in the exhibition matches leading up to the Sarajevo Games, once the Olympics began, the Team of Great Expectations faded immediately. First, they lost to Canada 4-2. Then to Czechoslovakia 4-1. And that was essentially the end of any Miracle redux. The team fought on, managing a 3-3 tie with Norway, routing Austria 7-3, before finishing weakly with a tie against Finland. Posted in Other Olympics, Winter Sports and tagged 1980 Lake Placid Olympics, 1984 Sarajevo Olympics, Al Michales, Chris Chelios, Eddie Olczyk, Herb Brooks, ice hockey, John Harrington, Lou Vairo, Miracle on Ice, Pat LaFontaine, Phil Verchota, Tom Barrasso. Bookmark the permalink.